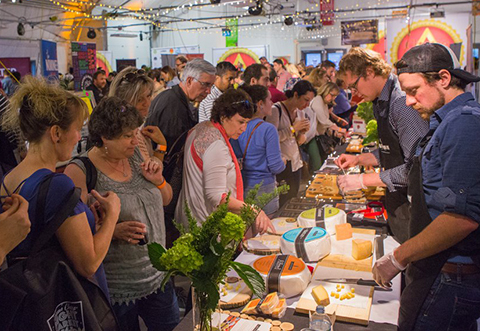 If you love cheese, you will love the seventh edition of #TGCCF—now the biggest artisan cheese show in North America. 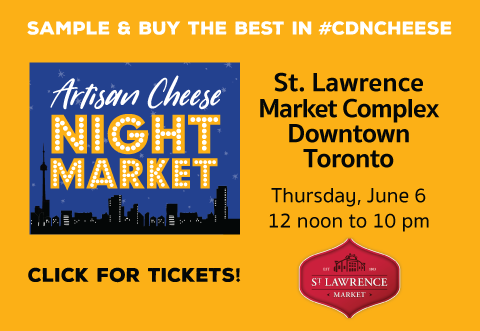 There will be more than 200 cheeses made by artisan producers from Atlantic Canada to British Columbia to sample and purchase. You’ll be able to meet cheesemakers themselves, including many from Québec. All in all, there will be an estimated 500 foods and beverages on offer from 130+ cheese producers, specialty food producers, small-batch wineries, craft breweries, craft cideries, a distillery and other exhibitors and vendors – much more than you can take in during one day, so plan to make a weekend of it! Take 401 East to Wooler Road, exit 522, and head south until you merge right onto highway 33. Follow highway 33 right through Picton, merging left onto highway 49. Crystal Palace will be on the left just before leaving Picton town limits. The street address is 375 Main Street East. The Main Street entrance will be open for vehicular traffic but for easier access to FREE parking we recommend using the Macsteven Drive entrance. After parking, follow the signs to the main entrance of the show located in Prince Edward Curling Club. Take 401 West to Marysville Road (Highway 49). Travel south until you enter Picton and Crystal Palace will be on the right just past the hospital. 1. Click Directions to and enter your town’s name beside the letter A. 2. You may drag the blue map line to modify your route or to make other stops along the way.